A current research preoccupation of mine is a photo of my maternal grandfather, Arthur David Belforti (born Achille Alessio Riccardo Belforti, 1902-1996), which my mother recently gave me and which is pictured here. Having had a close relationship with this grandparent, I have always been particularly keen on researching his past and his branch of the family. There is no handwriting on the reverse of the photo, and my mother has no details about it. My first thought upon seeing it was that it might have been taken in or near Detroit. My reasons for believing this were several – 1) before my grandfather was married, he lived in the Detroit area for a couple of years around 1929, drawn there to work at Henry Ford’s newly opened and highly innovative River Rouge plant; 2) his apparent age in the photo seems to match up with that time period; 3) I didn’t recognize the person who sits next to him in the photo, and neither did my mother; and 4) we didn’t recognize the place. My grandfather lived in just three places during his life – Italy, Massachusetts, and Michigan. I’m pretty familiar with the first two, but not so much with the third. There is a hard-to-read stamp on the back of the photo, and I decided to scan it and zoom in on the image to see if I could make out the words. This technique was successful and revealed “Jewell Photo Finish Laboratory.” I searched for these terms online, using Google and city directories. The searches found traces of only a few businesses with that name. One was in Clinton, Michigan (near Detroit), and none was in Massachusetts, which was the only other real possibility. What was most surprising is that the Clinton firm is still in business and has been since 1919. Since my grandfather was in the area around 1929, it seems highly likely that this photo lab and this photo go together. The puzzles that remain to be solved are the specific setting of the photo and the identity of the other person in it. I have looked through images of historic houses and estates in the Detroit/Dearborn area, but have not found any good candidates yet. I wonder if the occasion for this photo might have been a Ford company outing and if the companion is a coworker. Arthur was always a sharp dresser, but his clothing in this photo is clearly more formal than what he would have worn on a workday on the assembly line. I would be interested and grateful to hear from any readers who recognize the location. I would also be eager to hear from anyone who has researched a former employee of Ford Motor Company. My next step is to contact the Benson Ford Research Center, which holds most of the historic records for Ford, to see if I might be able to access my grandfather’s personnel file and any information the archives might have about employee outings. 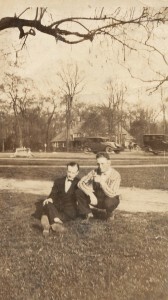 (The Research Center is part of the Henry Ford Museum, which has recently made some online collections available.) I will also get in touch with the current owners of Jewell Photo to see if they have any records that might be helpful. The time my grandfather spent in Detroit seems to have been one of the happiest periods of his life, brought to an end only by a car accident which left him so badly injured that he couldn’t work and had to return home to Massachusetts to be nursed back to health by one of his sisters. Whenever I or anyone would mention Detroit to him, he would say, “Ah, Detroit is the most beautiful city in the world!” Although he was doubtless aware of the hard times Detroit had experienced in recent decades, the city remained for him as it was in the late 1920s, and as a result, it has always remained that way for me, too. It looks like it could be the Police Sation on Bell Isle, which is an island park in the Detroit River north of downtown. Google Bell Isle for a picture. Correction Belle Isle Police Station…….sorry got excited. Thank you for the tip, Joan and Santa! I will check it out! Belle Isle would have been a likely place for an outing. The roofline and windows don’t look right to me for the Belle Isle police station. It could be a private residence — Grosse Pointe is a likely location for a house that size, but the paths don’t look like a private residence to me. And there are tons of large houses (again I am thinking Grosse Pointe) that do not qualify as historical. There are a few subdivisions in and around Detroit with big houses from that time period. Thank you very much for all these good suggestions, Ann! It’s hard to tell if the Belle Isle police station is an exact match or not, but it’s the closest thing I’ve seen so far. I will explore these other collections.